The unique design of the Secure-A-Pen counter pen has a refill built into the barrel, thus eliminating the possibility of tampering and rendering the pen unusable. Replacement pen snaps onto chain instead of replacing refill. Round base adheres securely to any flat surface. 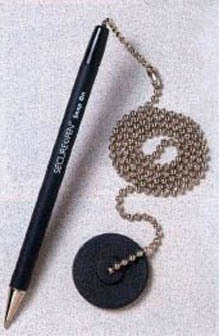 24-inch ball chain holds pen to base. Rubberized grip.Black pen with black ink. Secure-A-Pen counter pen, refill built into barrel eliminates tampering. Replacement pen snaps onto chain. Round base adheres securely. 24-inch chain, black pen with black ink.